Each year on Veterans’ Day, Three Dog Bakery donates 15% of the sales of all TDB branded treats from every outlet to FISH – (Friends in Service of Heroes). Established in 2013, FISH is a non-profit organization dedicated to helping veterans. 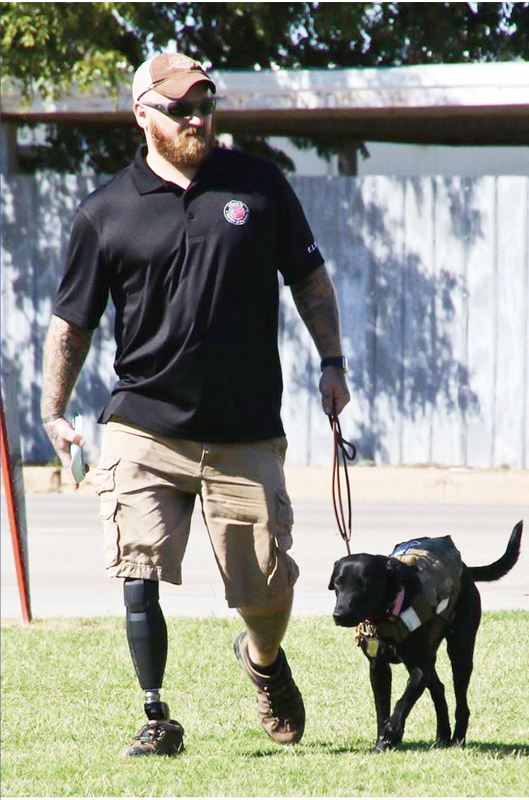 To date, they have provided many veterans with service dogs. The donation made by Three Dog Bakery on Veterans’ Day goes towards supplying a veteran chosen by FISH with a PTSD service dog. Since 2014 Three Dog Bakery raised over $20,000. Our goal of raising $10,000 this year is ambitious, but it is attainable with a little help from their friends. For years, July 17th had been a difficult day for Josh. It was the anniversary of his friend’s passing. It was a day filled with despair. There was a void. That all changed in 2016 when he welcomed Maggie into his life, coincidentally on July 17th. Maggie brought with her hope, and helped Josh cope with the sadness that had filled that day every year. Josh was in the Infantry with the 101st Airborne in the U.S. Army. He was deployed to Iraq in 2007 and served a full tour there. In 2010, he was again deployed, this time to Afghanistan. He had only been there for six months when he lost his leg. Upon returning to the U.S., he became sedentary. The once fit young man didn’t exercise and gained weight. He felt the support of his family and friends, but not from the country he had sacrificed so much for. It seemed that while he was fighting, the country was at the mall, oblivious of the horrors of a war a continent away. He became jaded. In early 2016, while attending a wounded warrior event, Josh was approached by Friends in Service of Heroes (FISH). They wanted to provide him with a service dog. He was a bit reluctant at first, believing that some of his fellow veterans might be more in need of a service dog than he was. After speaking with FISH, however, he soon became convinced that a service dog might be exactly what the doctor ordered. Maggie was a one-year old black Labrador Retriever and a service dog in training. FISH knew that Josh and Maggie would be a great fit and arranged for them to meet. So, two months after FISH initially approached him, Josh went to North Carolina and met Maggie. They spent a week together, with Josh learning the commands he must use and Maggie getting used to obeying Josh. The two bonded almost immediately and Maggie went to her new home with Josh in Kansas. Maggie has been with Josh for just over two years and the difference she has made in his life is unquantifiable. They are inseparable and have an unbreakable bond. Josh has a new zest for life, he is more active and has even lost weight. Maggie helps him cope with life’s stresses. While Josh normally uses his prosthetic leg to get around, he sometimes still use his wheelchair. On those occasions, Maggie pushes the handicapped button to open doors. She can perform a number of other helpful tasks and provides Josh with emotional support daily. Along with FISH and Three Dog Bakery, Maggie has restored Josh’s faith in humanity. To Josh, Maggie is heaven sent. To Maggie, Josh is everything.